What is vertigo disease? It is a feeling of spinning, swaying or tilting that can cause a person to fall or become nauseous. Vertigo is a specific type of dizziness that associated with many different health conditions rather than being a symptom all on its own. What we are going to consider today is a list of symptoms that are associated with vertigo. These can help a medical practitioner to narrow down the cause of your vertigo. Finally, we will consider what medical care is available for a person who is suffering from vertigo. You will be happy to learn that many are finding hope from a natural remedy. A false sensation of movement – Many people describe vertigo as the feeling that the room is spinning, but it may also appear to be tilting or swaying. Also, if you close your eyes, the sensation may switch over to the feeling that you are the one moving or spinning. Nausea and vomiting – If vertigo is particularly severe, you may feel sick to your stomach, much like a person feels when experiencing motion sickness. Vomiting is rare, but if vertigo is severe enough or lasts long enough, it can happen. Falls – Severe or unexpected bouts of vertigo can lead to falls. You may simply get up too quickly and not have time to balance yourself. Or you may lean over to pick something up and experience a sudden bout of vertigo. Falls can lead to serious injury, especially for the elderly who make be dealing with brittle bones. Tinnitus – This is the technical term for ringing in the ears. When a person is experiencing peripheral vertigo (caused in the ear), this is a common accompanying symptom. Headache – Vertigo and headaches frequently go hand in hand, especially if you are experiencing central vertigo (caused in the central nervous system). Hearing loss – This is another symptom associated with peripheral vertigo and may occur if the cause is viral or due to a vestibular condition. Pressure in the ear – When vertigo results from fluid in the ear, you may also feel pressure as though the ear is full. Sensory sensitivities – This is common when the underlying cause is a migraine. Cardiac or stroke symptoms – Vertigo can, on rare occasion, be a symptom of a medical emergency. If you are experiencing other symptoms of a heart attack or stroke, seek emergency medical attention immediately. Positional Vertigo – In this case, vertigo attacks are triggered by certain positions of the head. Bouts are usually brief but can recur frequently. While the condition itself is not a danger, vertigo can still lead to falls. Meniere’s Disease – This vestibular condition presents with four classic symptoms: vertigo, tinnitus, hearing loss, a feeling of fullness in the affected ear. Usually, only one ear is affected by Meniere’s disease. Vestibular Neuritis – The vestibular nerve carries signals between the ear and brain regarding balance and spatial orientation. Some viruses like the flu or a cold can cause inflammation that affects this nerve. Trauma – Vertigo is common following head and neck injuries. 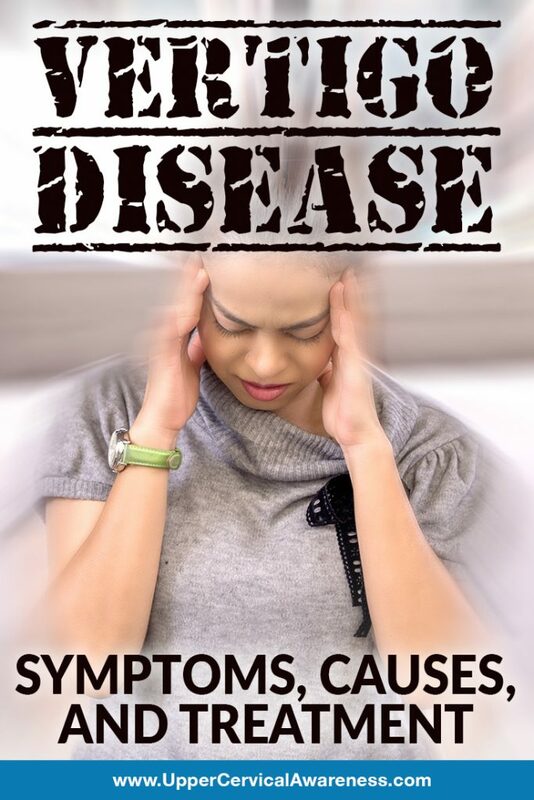 Migraines – Up to 40% of migraines present with vestibular symptoms including vertigo. Medications – Vertigo is a common side effect, especially from certain classes of medication like blood pressure drugs and antidepressants. Neurological Conditions – Besides migraines, a number of other neurological conditions can cause vertigo including multiple sclerosis. There is no cure for vertigo itself other than to try and identify the underlying cause and correct that. However, there are a number of ways to try and relieve some of the symptoms. For example, anti-nausea medications can be provided for patients who get sick when experiencing vertigo. There are injections that can be put directly into the ear which may help some who have Meniere’s disease. Some surgeries are available to help with vertigo although these are often destructive and should be a last resort at best. Because of the invasive nature of many of these vertigo treatments, and because they often have limited benefits, more and more people are searching for natural care. Is there a way to find lasting relief? We’d like to introduce you to upper cervical chiropractic care. This is a niche in the chiropractic field that focuses on the C1 (atlas) which is positioned at the base of the skull. Because it can affect everything from how the ears drain to how the brainstem functions, it can be responsible for a number of central and peripheral causes of vertigo. Thus, it makes sense that when patients suffering from vertigo and this misalignment receive upper cervical chiropractic care in case studies, the results have been astounding. Once study saw 80% of patients completely free from vertigo after care. If you are suffering from vertigo, especially if you have suffered a head or neck injury at any time in the past, we encourage you to get an examination from an upper cervical practitioner. It may be your first step to finding natural vertigo relief.